Zimbabwe’s President Robert Mugabe has made his first public appearance since the country’s army took over on Wednesday. He attended a graduation ceremony in the capital, Harare. Mr Mugabe had been under house arrest for days. The army made its move after a power struggle over his successor. Mr Mugabe walked slowly up a red carpet and joined the crowd in singing the national anthem, then opened the graduation ceremony at Zimbabwe’s Open University, where he is chancellor. Neither the 93-year-old president’s wife, Grace Mugabe, nor Education Minister Jonathan Moyo – an ally of hers whose house was reportedly raided by the military – were present. The army acted after Mr Mugabe sacked Vice-President Emmanuel Mnangagwa last week. Mr Mnangagwa was seen as a potential successor and his sacking paved the way for Mr Mugabe’s wife Grace Mugabe – who is four decades younger than him – to take over the presidency instead. 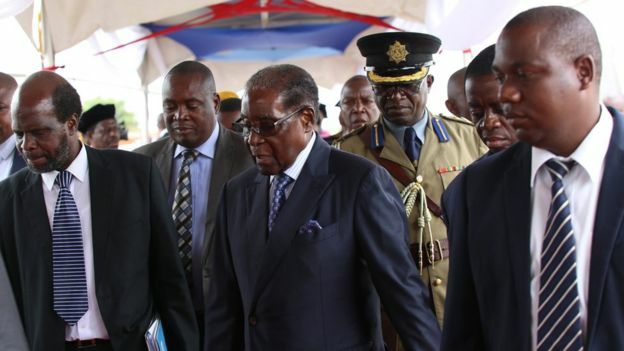 Mr Mugabe’s attendance at the graduation is an annual tradition but few expected to see him there, the BBC’s Andrew Harding reports from Zimbabwe. Mr Mugabe’s appearance at the graduation ceremony made it look like business as usual but it’s not. This has simply added to the confusion about his future. The military has essentially been in control for three days and, with the help of South African envoys, has been in talks with Mr Mugabe. This cunning and experienced leader has resisted the push to go immediately but he is facing unprecedented pressure to step down after nearly four decades in power.